This week we give the floor to Paulo Tarso de Oliveira Gomes, International Relations Security Manager at Rio 2016 Organising Committee for the Olympic and Paralympic Games, as he talks on sports betting and preparations for the Rio 2016 Olympics. For the first two weeks of June, there have been a variety of issues ranging from bribery and match-fixing allegations in Australia and Malta, to suspicious betting in United States, as well as bans for doping violations in Nigeria and Russia. During my 32 years of service as a Federal Police Officer in Brazil, I have never heard of any event held in the country to discuss specifically the issue of integrity in sports. Our experience in this matter was limited to a few cases in the past regarding match-fixing in football matches. Online bets are not part of the betting culture in Brazil. Therefore, we do not have specific legislation on the subject. However, with billions of people diverting their attention to Rio this year, including the betters and gamblers, we will need to be prepared to identify and suppress any behavior that could jeopardize the integrity of the games. 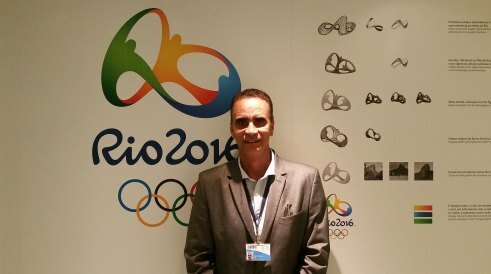 As the Security International Relations Manager at Rio 2016 and single integrity contact point with the International Olympic Committee (IOC) for the Integrity of Sport, I was pleased to have had the opportunity to participate in the workshop held jointly by the IOC and INTERPOL in Rio de Janeiro, from 30 to 31 May. This event was not only a very good opportunity for all of us to learn about the best practices worldwide against the manipulation of sports but also about the tools used to prevent and enforce these illegal practices, such as the “handbook of protecting sport from competition manipulation”, launched by the IOC and INTERPOL. With only eight weeks to the opening ceremony, I can state that the Rio 2016 Organising Committee for the Olympic and Paralympic Games, in close partnership with the Brazilian authorities, is fully committed and engaged in the prevention and investigation of any form of crime against sports. The creation of the Joint Integrity Intelligence Unit (JIIU), between the IOC and Rio 2016, is proof that all measures will be taken to ensure the beauty of games through results that only depend on the skill and effort of each athlete. From the creation of the JIUU, we can also built a partnership with the Special Secretariat for Security of Major Events (SESGE). This partnership will allow us to work with their intelligence cell if anything suspicious should arise. This cell will have representatives from all law enforcement agencies and will work around the clock during the games. The NRL is bracing itself for another scandal after NSW Police confirmed its organised crime squad has opened an investigation into alleged match-fixing in the league. “The Organised Crime Squad is in the early stages of examining information relating to alleged match fixing in the NRL,” a police spokeswoman said. “No further comment is appropriate at this stage.” The NRL confirmed on Thursday morning they were cooperating with authorities in the investigation. “The NRL is treating this as a serious matter and will take any action necessary to protect the integrity of the game,” an NRL spokesman said. The Australian Crime Commission warned in their February 2013 “blackest day in Australian sport” press conference that criminal figures were possibly infiltrating sporting clubs, with the danger that they could manipulate results. Detective inspector Wayne Walpole, in charge of the state’s charter against organised crime infiltrating sport, told News Corp Australia on Thursday such infiltration had already begun at clubs. “I’m not saying corruption or match fixing has happened, but I’m saying the infiltration is there and that infiltration can lead to the compromise of the sports of the athlete,” he said. The NRL was last hit by match-fixing allegations in 2010 when Ryan Tandy was convicted of trying to fix the early stages of a match between his Canterbury team and North Queensland. Nine Malta Under 21 players were approached last March and asked to take part in a scam which would have seen Malta lose a European championship qualifier match against Montenegro by three goals to nil, but only two were interested the offer - Kyle Cesare and Emanuel Briffa - and consequently the match-fixing plan was abandoned, a court was told today. Malta eventually had lost the game by a single goal. The Asian betting syndicate that was behind the match-fixing attempt then set sights on the subsequent match which the U21 side was due to play against the Czech Republic a few days later. But its plans collapsed in that case too. Golf great Phil Mickelson wasn't anywhere near a courthouse in California on Monday when a 57-year-old money launderer was sentenced to a year and a day in prison. The name of the three-time Masters winner didn't even come up. But for the second time in less than a month, Mickelson's gambling was linked to court proceedings in which a suspected gambling associate faced criminal charges. Gregory Silveira, who was also fined $18,000, had pleaded guilty to money laundering for transferring $2.75 million between bank accounts in March 2010 for an unidentified client to promote an illegal gambling operation. Mickelson was the gambler, according to a man who describes himself as a longtime friend of Silveira's and two other people familiar with the matter. In a different case three weeks ago, Mickelson agreed to pay back almost $1 million he earned by trading on a stock tip from friend and gambler William "Billy" Walters, according to the Securities and Exchange Commission. Walters, who faces charges of insider trading, has pleaded not guilty. Mickelson hasn't been accused of wrongdoing in either case. Mickelson's ties to the two men threaten the image of one of the game's most popular players and forces the PGA Tour — which is considering allowing online casinos to host real-time gambling on its tournaments — to confront whether his betting puts the sport at risk. The code of conduct tells players not to associate with gamblers and others who "might reflect adversely upon the integrity of the game”. The International Association of Athletics Federations have confirmed an eight-year doping ban for quartermiler Tosin Adeloye who tested positive for a performance enhancing drug in July last year at the Warri Relays/CAA Super Grand Prix meeting in Warri, Delta State. Adeloye, who represented Nigeria at the IAAF World Championships last year in Beijing, China where she ran 52.42 seconds in heat two of the first round of the 400m event before crashing out, will be out of action from July 24, 2015, the day she was caught to July 23, 2023. The 20-year-old Ekiti State athlete who is the reigning African junior 400m queen and anchored the Nigeria 4x400m relay team of herself, Esther Asamu, Yinka Ajayi and Praise Idamadudu to gold at the 12th African Junior Athletics Championships last year in Addis Ababa, Ethiopia had previously served a two-year doping ban and was expected to be handed a lifetime ban as a second offender following the positive test in Warri. MOSCOW (AP) — Six Russian weightlifters, including former world and European junior champions, have been banned for doping violations, the country's national anti-doping agency said Monday. The agency said 2014 world junior champion Larisa Kobeleva received a four-year ban, while 2014 European junior champion Nadezhda Ovchinnikova was suspended for two years. The four other weightlifters received sanctions of between four and eight years for doping offenses committed last year. The agency did not publish details of the offenses.Russia's weightlifting team is already under pressure after four of its top athletes, including world record holder Alexei Lovchev, were banned for doping at November's world championships. Lovchev has appealed.